Cooling products are Arctic Cooling's main gig but over the years the Swiss company has branched out into many other product categories. For this review I've inspected the Arctic K381, a basic keyboard for people who don't need dozens of bells & whistles. If you're looking for a gaming keyboard you better stop reading here, but if you desire a keyboard that is as compact as possible the K381 may be of interest to you. The Arctic K381 ships in a surprisingly small box, you immediately see that this keyboard is a lot smaller and thinner than traditional keyboards. Little extras are found in the box, besides the keyboard the only other thing that is included is a brieflet that explains the functions of the special keys. A CD-ROM isn't included because the keyboard has no special features that require a driver. The K381 is available in black and white and in the following keyboard layouts: US Standard, British, German, French, Spanish, Portuguese, Italian and Polish. The model I'll be inspecting in this review is a black K381 with French AZERTY layout, I'd prefer a model with Belgian AZERTY layout as that's what I've grown up with but the French layout is the closest match Arctic Cooling has to offer. Arctic Cooling made the K381 as small as possible, it measures only 43cm x 11.5cm because it only provides the bare essentials. The keyboard's size is just large enough to fit all the keys and there's no wrist rest. The lack of unnecessary plastic results in a weight of just 555g. The front is made of matte black plastic and the USB cable is of decent length. 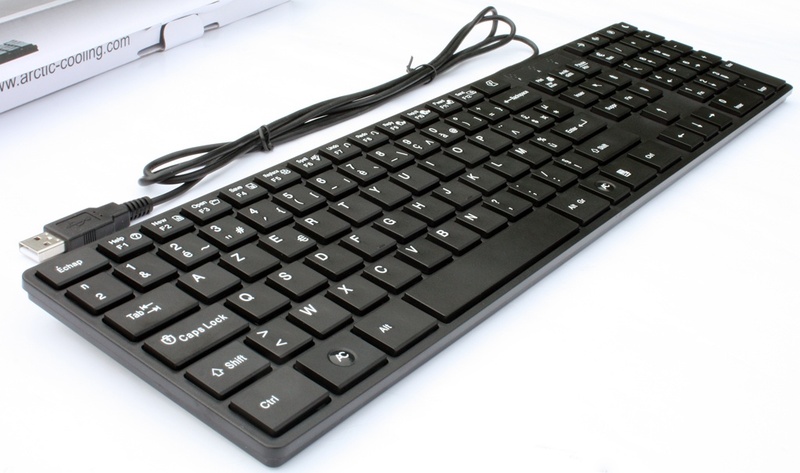 Few extra keys are included, each of the function keys has a second functionality and the right corner features volume control buttons. The profile of the K381 is very thin, the front has a height of just 12mm and the back is about 20mm. Four rubber feet should prevent the keyboard from skidding on your desk. Unfortunately, there are no risers so you can't adjust the height of the keyboard. Here's a closeup of the feet. 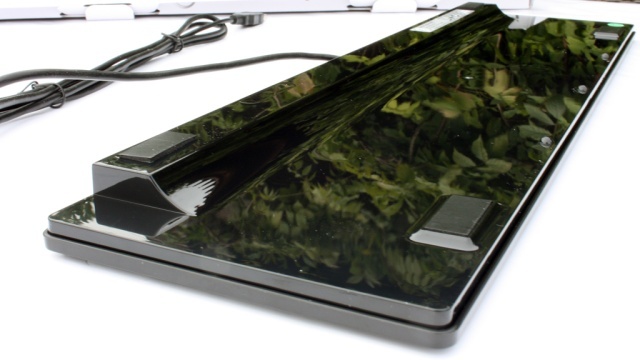 Additionally, you can also see that the rear is made of pretty reflective plastic.